Rep. Sheila Jackson Lee Tweets President Trump Determined to Start War with North Japan-Fiction! - Truth or Fiction? Rep. Sheila Jackson Lee Tweets President Trump Determined to Start War with North Japan-Fiction! 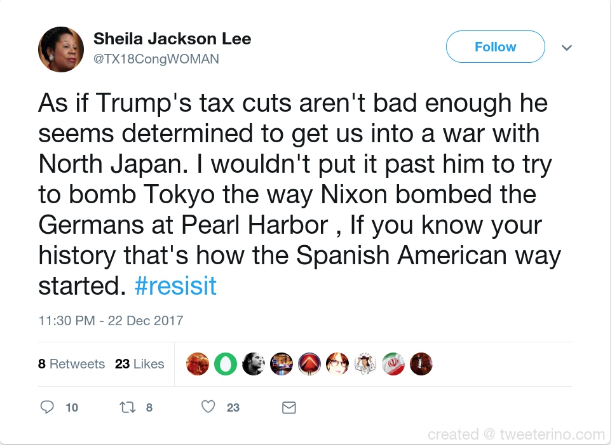 U.S. Rep. Sheila Jackson Lee (D-TX) tweeted that President Trump is determined to start war with “North Japan” and referenced Nixon bombing Germans at Pearl Harbor. A website that allows users to generate fake tweets from high-profile people is behind Sheila Jackson Lee’s bogus tweet about Trump starting war with North Japan. A website that allows users to create fake tweets is behind a false rumor that Sheila Jackson Lee tweeted President Trump is determined to start war with North Japan. Tweeterino.com makes it easy to generating hoax tweets like the one about Sheila Jackson Lee. Sheila Jackson Lee has been a frequent target of Tweeterino.com users. We previously debunked a tweet claiming that she blamed a train derailment in Washington State on Trump’s “racist agenda.” This “North Japan” tweet is the latest hoax.